Over the holidays, I found myself thinking back to another Christmas of over 25 years ago. 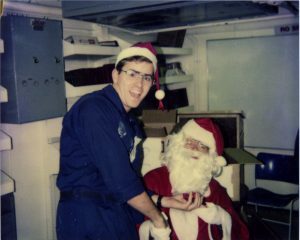 I was serving in the Navy on the USS Elliot (DD-967) and it was yet another Christmas away from home. I was in a funk at the time though now I’m not sure which one of the many possible causes was responsible. I’m pretty sure I was nearing the end of my enlistment. I definitely remember that the deployment was ending and we were bound for San Diego. Maybe it was because I had been butting heads with some of the other guys in my division (we didn’t always get along and when I finally earned some rank I became more comfortable with confronting the slackers and assholes). Maybe it was simply because I didn’t know what I should be doing with my life. Still don’t, actually. But there I was at sea. It was about 8 AM. I had been working midwatches and had just come off of twelve hours of nighttime duty. I was in my rack, exhausted and feeling depressed. I just wanted to sleep and make the time pass as quickly as I could. This morning would be different. Announcements over the 1MC kept interrupting my sleep, announcing the arrival of Santa Claus. I snickered at the idea that some guy had dressed up and been delivered to the ship via helo (yes, kids, Santa travels by helicopter at sea). I kept my eyes shut and tried to go to sleep but my thoughts kept drifting back to how goddamn lonely I was feeling. One more announcement came across. Santa was getting ready to leave, it said. Last chance. Listen, you dumbshit, I thought. Yeah, I’m feeling down. I could be anywhere but here now. But some guy actually went to the trouble of putting on a Santa suit and getting hauled around the battlegroup. Dammit, I’m going to show some appreciation. I leaped out of my rack, threw on my coveralls and a Santa hat, and made my way admidships to the ship’s library. As advertised, there was Santa in the back of the room with a sack of gifts. 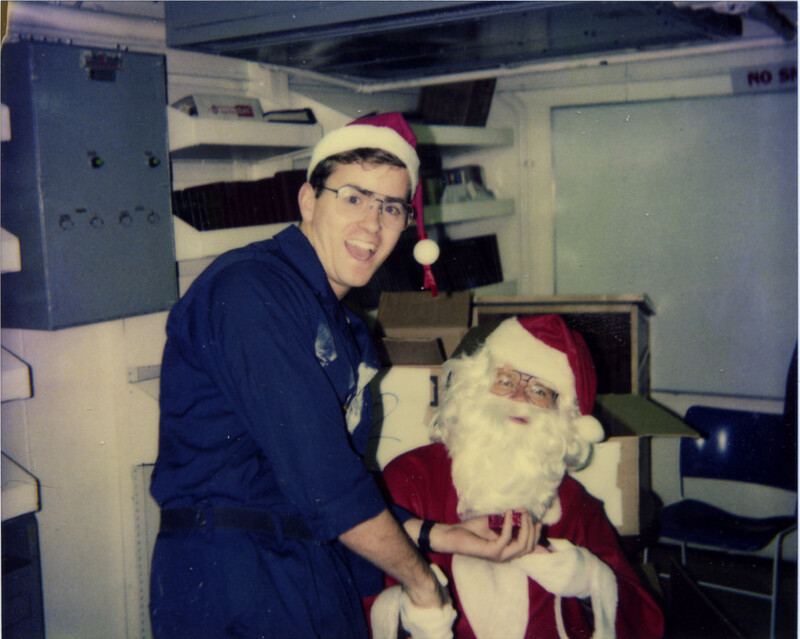 I waited behind one other sailor before I went up to Santa, shook his hand, and got my picture taken. The smile you see is actually genuine. I returned to my rack shortly afterward but I was a changed man, no longer dragged down by my pity party. It doesn’t matter what the gift was or that it was a fake Santa or that it was a mere thirty second event. My attitude had totally changed. It was the boost that I really needed right then. I don’t know who that Santa was, but his visit was a gift I still appreciate today.